From left, senior IHSA riders Mary Kate Bailey, Katrina Matz, Maddy Lee, Katie Fisher and Hannah Beall stand for one last photo Saturday at Rogers Riding Center. 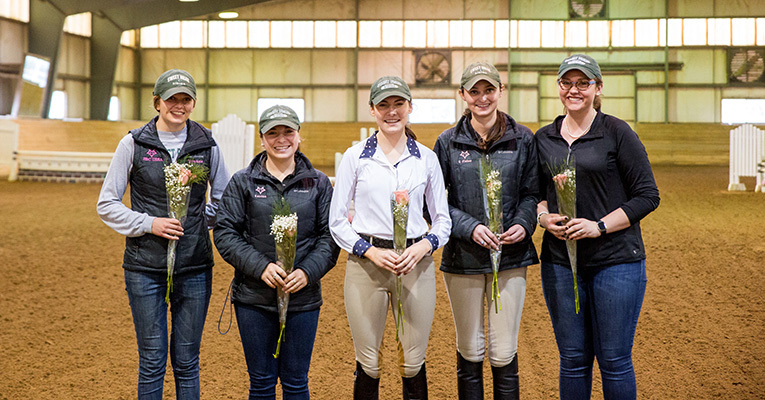 Sweet Briar riders were victorious at home on Saturday, Feb. 25, claiming the high-point team championship at the Intercollegiate Horse Shows Association competition at Harriet Howell Rogers Riding Center. As show co-hosts with Lynchburg College, the Vixens scored 46 team points for the win. The day started well when Makayla Benjamin ’18 won both her open flat and fences classes, making her the show’s high-point rider. Also riding in open fences was Emily Schlosberg ’19, who placed third. Senior Maddy Lee, who was celebrating a birthday, rode next in intermediate flat and fences, finishing first and fourth. Sarah Miller ’20 competed in novice fences and flat, riding to first- and third-place finishes. Junior Courtney Barry finished fourth in novice flat and fifth in intermediate fences. Makayla Benjamin ’18 competes Sunday at UVa. Photo by Katherine Powers. The team continued to ride well throughout the day, says Madi Cromwell ’16, Sweet Briar’s riding fellow. In the afternoon, first-year Ellyn Narodowy finished second in advanced walk, trot, canter and McKenzie Michiels ’20 took the blue ribbon in beginner walk, trot, canter riding Lightfoot, Sweet Briar’s “famous” Appaloosa, Cromwell said. Jade Ashley ’20 capped off the day with another first-place ride in walk, trot. 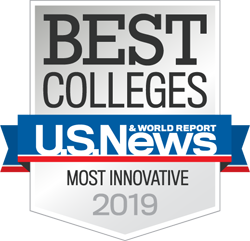 Both the Sweet Briar and Lynchburg College riders worked hard to organize the show and make sure it went smoothly, Cromwell said. The Vixens next rode in the last regular IHSA show of the season Sunday at the University of Virginia. The team tied for third place with Randolph College, allowing them to finish fifth in regional standings this year. 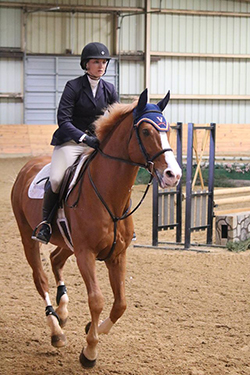 The UVa show allows only one entry in each class, which differs from other IHSA competitions. Thus, there are nine riders in each class, one per school. Narodowy took the blue ribbon in advanced walk, trot, canter. Ashley, riding in walk, trot, and Benjamin, competing in open fences, both landed second-place ribbons. Schlosberg finished third in novice flat. Benjamin ended the season as the Zone 4, Region 2 reserve champion for the Cacchione Cup Competition. Each region sends the top hunter seat point-earner to compete for the cup in the IHSA national finals. Several Vixen riders qualified for the Region 2 finals, which will be held March 19 at UVa. They are Benjamin, who’ll compete in open fences and open flat; Lee, riding in novice fences and novice flat; Aoife Magner ’19 in intermediate flat; and Schlosberg in intermediate fences.